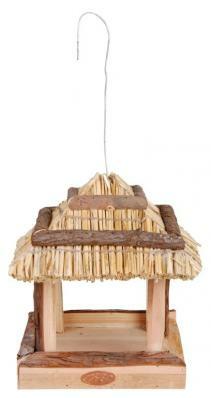 This large traditional thatched roof bird table with a rural appearance offers birds a nice feeding place. Because of the open structure the birds can easily approach the table from all sides and find a place. The natural straw roof ensures the food will stay dry. Thanks to the metal hook on top of this bird feeder it can be suspended anywhere in the garden.